Henry Hazlitt's Economics in One Lesson is a good place to start. The idea that technology will cause widespread job-loss and economic upheaval is such an old fear, and it never works that way. Technological innovations lead to wealth creation 100% of the time, along with more opportunities for more people, even if some jobs are initially replaced with other jobs. "This time is different" is announced everytime, and it's always the same. This book is very good for anybody wishing to understand basic economic theory and see many examples throughout history of this exact debate taking place over and over and over again: https://www.amazon.com/gp/product/0517548232/ (see the chapter "The Curse of Machinery"). Henry Hazlitt, one of the economists quoted in the article, wrote a book called Economics in One Lesson . It is a brilliant, and very approachable, piece of writing that should be read by everyone interested in the basics of economic theory. Also, I second Walden by Thoreau and suggest you read the Fountainhead. The Fountainhead isn't quite as blunt as Atlas Shrugged, but I find it a lot more life affirming and positive. 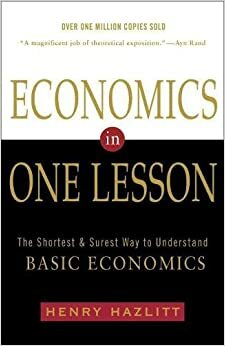 There's a lot to economics, one book that I think is really insightful and quite easy to read is Economics in One Lesson. It's main function is to highlight second order effects, or unintended consequences, of legislation on activity. Your response is very silly. The answer to OP's question is far simpler - no need to call anybody racist - and has to do with economics. Chapter 23 of Henry Hazlitt's Economics in One Lesson explains that the purpose of inflation is to cancel out minimum wage laws. Devalue the currency and suddenly businesses can afford to pay $15/hour to flip burgers. But inflation is worse than that; it necessarily involves a wealth transfer from the poor to the rich (since the wealthiest folks are those closest to the newly minted money). This is very useful to people in power because the effects are largely indirect and invisible. The Nixon Shock of 1971 removed the exchangability of US dollars and gold, instituting a freely floating currency and unleashing the Federal Reserve's power to devalue the dollar with impunity. This has involved a massive transfer of wealth from the bottom to the top, sucking purchasing power out of the middle class and resulting in the current situation that OP is inquiring about. This chart shows inequality over time and illustrates what happened since the 70's. Upvoted as I also think a simple right vs left axis is an unhelpful way to describe a complex set of policies. The advantages of learning about economics go way beyond understanding Bitcoin. Economics (in the school started by Carl Menger, Ludwig von Mises, etc), is the study of how people act in order to achieve happiness. It asks: given people have certain goals (but without making any judgements on what those are), and limited time and resources to achieve them, how should they act to maximise their satisfaction? Even a man alone on a desert island is acting economically: should he spend another hour making shelter, another hour catching fish, or another hour relaxing in the sun? The economics of trade is built on top of this. Will one person with too much fish, and another with too much wood, discover they're both happier after trading than they were before, even though the total amount of wood and fish in existence has not changed? Indeed, the most important work on economics by Mises is called simply Human Action. >I strongly recommend that every American acquire some basic knowledge of economics, monetary policy and the intersection of politics with the economy. No formal classroom is required; a desire to read and learn will suffice. There are countless important books to consider, but the following are an excellent starting point: The Law by Frédéric Bastiat; Economics in One Lesson by Henry Hazlitt, What Has Government Done to Our Money? by Murray Rothbard; The Road to Serfdom by Friedrich Hayek, and Economics for Real People by Gene Callahan. >If you simply read and comprehend these relatively short texts, you will know far more than most educated people about economics and government. … If you care about the future of this country, arm yourself with knowledge and fight back against economic ignorance. I did exactly this and read them one by one. I summed up my findings in this blog post. I've found the books in the list above enough to defend against the biggest and most common fallacies you see in the news. I highly recommend reading at least one, if not all of them, and Economics in One Lesson is the one I recommend most.